Anchorage residents attend the Covenant House candlelight vigil at Town Square Park. The annual event is held to remember the thousands of homeless youth who have entered the doors of Covenant House Alaska. 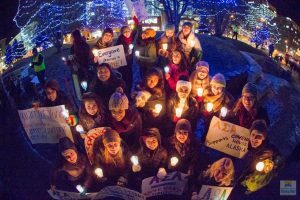 On Nov. 16, people gathered in Anchorage’s Town Square Park to take part in the annual Covenant House Candlelight Vigil, which raises awareness of youth who have no place to call home. Despite the cold wind that evening, it was a night filled with hope and beacons of light. Many shared their words of hope and help for those affected by homelessness. There was a sense of unity, as the thousands of homeless youth who have entered the doors of Covenant House Alaska were celebrated: brave young men and women seeking shelter from the cold, dark, emptiness of the streets, and kids from all walks of life, seeking safety, stability, or a sense of dignity. Following the candlelight vigil, more than 40 Anchorage business executives took part in the annual sleep out in the courtyard of Covenant House. The funds raised go directly to getting kids off the streets and raising awareness of the challenges faced by homeless youth. Southcentral Foundation is proud of its long-standing collaboration with Covenant House Alaska, which includes the provision of a full-time nurse practitioner and suicide prevention counselor at the shelter.